Following on from December’s production of The Elephant Man the New Year begins with another production, The Wolf Inside, by Nick Rothwell and Flora Kimberley. 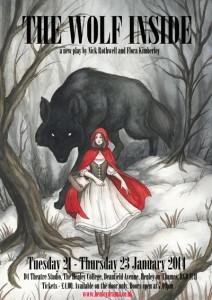 The play is inspired in part by the story of Little Red Riding Hood, but is a dark and sinister retelling of the story with modern overtones. The production will be staged in the College’s D4 Studio Theatre from Tuesday 21 January until Thursday 23 January. Tickets are priced at £4.00 and will be available on the door.